The word politicide was first coined by Abba Eban – Israel's foreign minister in 1967 – to describe the attempted murder of the sovereign, independent State of Israel by enemies both within and outside of the fledgling state. When Victor Sharpe first read the word, he told me how it resonated in "the deepest parts of my heart and soul." 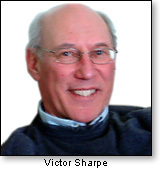 A passionate student of Jewish history – as well as a prolific writer on contemporary Jewish and geopolitical issues – Sharpe was mobilized into action, believing that his determination to protect and defend Israel and to illuminate the wider public about the tiny state's chronically imperiled status, demanded that he write a book about...politicide! His first politicide book was published in 2006, with a second book following in 2009, and a third book in 2011. 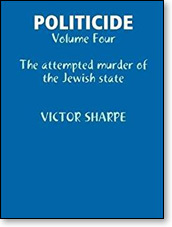 Now he has written his fourth opus: Politicide: The attempted murder of the Jewish state. In this riveting volume, Sharpe describes in painful detail the annihilating historical attacks upon the ancient Jewish homeland by the immensely powerful Assyrian, Babylonian, Greek, and Roman empires, which, significantly, no longer exist. He also describes the inexpressible suffering endured by the stateless Jews throughout their 2,000 years of exile in the diaspora, during the Crusades and the Inquisition, and through the cruel expulsion of Jews from various countries including England, Spain, and Portugal, the bleak pogroms in Poland and Russia, and the worst crime in human history, the genocide during the 1940s of six million Jews in Hitler's German-occupied Europe. But to counter this painful history, Sharpe describes in vivid detail the exceptional history of Jewish life from its beginning with Abraham the first Jew – the Holy Convert – who left his idol- making father after discovering the existence of the one-and-only God, thus establishing monotheism for the entire world. He describes how Abraham and his wife Sarah, along with Isaac and Rebecca and Jacob and Leah and Rachel, became the patriarchs and matriarchs of the Jewish People in the eternal and Covenanted Land of Israel to which God brought them. And finally, Sharpe tells the story of the miniscule but powerful 14 million Jews who now exist – half of them in the miraculous and flourishing State of Israel – in a world of seven-and-a-half billion people, including over a billion Christians and over a billion Muslims. On November 29, 1947, the United Nations voted on Resolution 181 to declare the establishment of a Jewish State in the land to be known as Israel. Ironic, yes, that the UN today is a virtual cesspool of virulent anti-Semitism run by tin-pot dictators and rancid racists. On May 14, 1948, the man who would become the first Prime Minister of Israel, David Ben-Gurion, who was then the head of the Jewish Agency, proclaimed the establishment of the State of Israel. On that very day, U.S. President Harry S. Truman recognized the new nation! "In 1995, Congress adopted the Jerusalem Embassy Act, urging the federal government to relocate the American embassy to Jerusalem and to recognize that that city...is Israel's capital. This act passed Congress by an overwhelming bipartisan majority and was reaffirmed by a unanimous vote of the Senate only six months ago. Yet, for over 20 years, every previous American president has exercised the law's waiver, refusing to move the U.S. embassy to Jerusalem or to recognize Jerusalem as Israel's capital city. "Therefore, I have determined that it is time to officially recognize Jerusalem as the capital of Israel. Israel is a sovereign nation with the right like every other sovereign nation to determine its own capital...."
There is even talk that as Israel celebrates its 70th anniversary as a sovereign state this coming May, the American president may be the most honored guest in attendance. And yet, in the mere 70 years since Israel's establishment, a resurgence of anti-Semitism is sweeping the globe in what can only be described as a pandemic. This is not surprising for the European countries where it once flourished or for the Muslim countries where their "holy" book mandates the death of all infidels, Jews particularly. But it is very disheartening that this obsessive Jew hatred is also rampant in the hallowed halls of the United States Congress, where, according to American Thinker's Thomas Lifson, no less than seven Democrats embrace the Hitler-admiring racist "Reverend" Louis Farrakhan, whose recent remarks include that "the powerful Jews are my enemy." All this makes Victor Sharpe's book downright urgent for readers who are interested in historical facts and not inflammatory and hateful rhetoric. 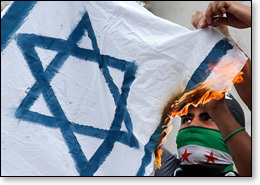 Perhaps by serendipity, it is also the ideal primer for students in the not-so-hallowed halls of American academia – both Jewish and non-Jewish youth alike – whose leftist, anti-Semitic professors expose them to the obscene Boycott-Divest-Sanction movement to destroy Israel and other malevolent anti-Israel indoctrination. In short, this is a terrific, illuminating, important book that readers will learn from, share with their friends, and cherish for its richness.